Jacques Brel, Georges Brassens and Léo Ferré are three emblematic figures of post-war French popular music who have been constantly associated with each other by the public and the media. They have been described as the epitome of chanson, and of 'Frenchness'. But there is more to the trio than a musical trinity: this new study examines the factors of cultural and national identity that have held together the myth of the trio since its creation. This book identifies the combination of cultural and historical circumstances from which the works of these three singers emerged. It presents an innovative analysis of the correlation between this iconic trio and the evolution of national myths that nurtured the cultural aspirations of post-war French society. 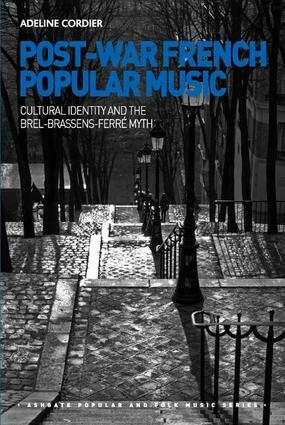 It explores the ways in which Brel, Brassens and Ferré embody the myth of the left-wing intellectual and of the authentic 'Gaul' spirit, and it discusses the ambiguous attitude of post-war French society towards gender relations. The book takes an original look at the trio by demonstrating how it illustrates the popular representation of a key issue of French national identity: the paradoxical aspiration to both revolution and the maintenance of the status quo. Adeline Cordier studied at the Universities of Bordeaux, France and Stirling, Scotland. She is the author of various studies of French chanson and cultural identity. She is now an independent researcher and works on the representation of women and gender relations in post-war France through the work of female singer-songwriters.